Helene Renate Hvedding says the uninvited guests weren’t exactly unwelcome, even if they seriously disrupted plans to spend a weekend with her significant other at their cabin. 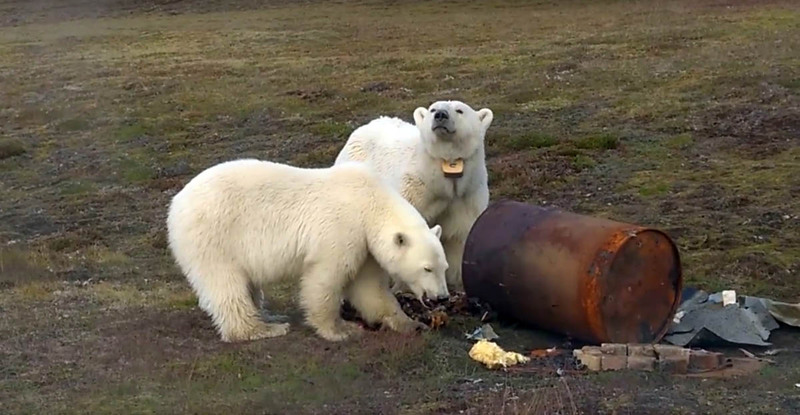 A mother polar bear and her cub showed up as the couple was preparing to light a charcoal grill outside their cabin at Revneset the Friday before last, forcing the couple to hastily retreat indoors and stay there for four days as the bears lingered to feast on garbage and anything else they could find that was edible. But while the bears damaged the barbecue area and left things bit disheveled before they departed, Hvedding said the weekend wasn’t scary or unpleasant. The bears’ visit to the area across the channel from Longyearbyen was far more disruptive for participants of an archaeological excavation at the abandoned mining settlement of Advent City. Between visits to Hvedding’s cabin, the bears intruded on the archaeological site and chewed on equipment after the participants were forced to flee. Frigga Kruse, a University of Groningen researcher leading the project, told Svalbardposten they finally decided to pack up the expedition. “It is not possible for us to continue now, it’s not safe,” she said, adding their field work was cut short by about a week. The Governor of Svalbard monitored the bears during their visit, but opted not to chase them from the area unless they wandered closer to Longyearbyen. They moved further north on Tuesday, allowing the humans held captive there to depart. Researchers and tour guides are reporting sightings this summer of bears wandering into unusual territory and eating unusual foodstuffs ranging from bird eggs to kelp, possibly due to record-low level of sea ice during the winter and spring that greatly limited hunting options. Hvedding said she believes hunger may be driving bear toward cabin areas, and she and her neighbors are keeping each other updated about any possibly sightings. The mother bear poked around the exterior of the cabin at times, coming into close eye contact with Hvedding at one point, but she said there was no indication it was trying to break in. Hvedding and her companion, Knut Eide, also has their two dogs with them, but she told Verden’s Gang they remained calm throughout the weekend. “They’ve been sleeping pretty much all weekend and may possibly have not discovered the two quiet polar bears outside” she said.